What makes a thirty year old movie hot again? A lot of time a movie comes back into vogue because the actor or actress has had an amazing comeback. Or a critic champions the movie in an intriguing article elevating the movie. Rarely does a comedy comeback because the situation at the core of the movie is back in the news after 30 years. 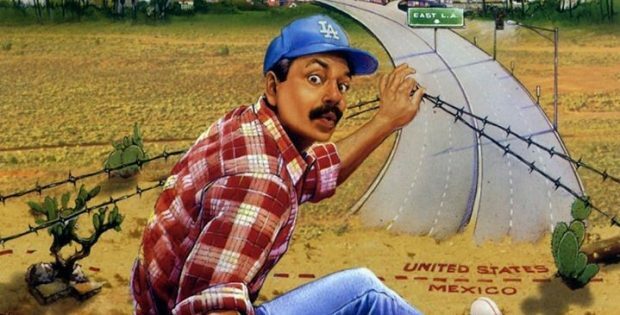 Born in East L.A. was released in 1987, but it might as well come out today with its tale of how an American citizen was deported by immigration authorities. Rudy Robles (Cheech Marin) is a native Los Angeleno that installs massive stereos in small cars. He cruises around in a pink VW Bug that’s pimped out. He’s single and living with his mom. One day before work, he’s told he needs to drop by a toy factory that evening to pick up his cousin Javier (D.C. Cab‘s Paul Rodriguez). After a day of goofing around, Robles arrives at the factory just in time for a raid from the immigration officers led by the sunglasses wearing McCalister (the recently departed Jan-Michael Vincent). Robles can’t provide any identification because he left his wallet at home. Even worse is his mom has gone off to Fresno so there’s nobody to take a call and rush his wallet down to the police station. In McCalister’s tinted eyes, Robles is just another Mexican that snuck over the border. And thus he tosses him back over the wall. This isn’t great since Robles barely speaks enough Spanish to offer at Taco Bell. He tries legal means to get back into the USA, but no one believes he’s an American. He ends up having to hustle bizarre jobs for Jimmy (Home Alone‘s Daniel Stern) who runs bars and tattoo parlors in Tijuana. He needs the money to pay off a smuggler that will get him home. During his exile, he does find Dolores (Kamala Lopez-Dawson). She is from Central America and is waiting to get to America. Robles comes to realize that his journey North might not be alone. Born In East L.A. was originally a joke song done by Cheech and Chong to spoof Bruce Springsteen’s Born In the USA. They were getting some Weird Al action. The video was a hit on MTV which seemed like a trailer for a move. So naturally a movie studio came calling. The big issue was not the subject matter, but the fact that Cheech and Chong movies were’t bringing in the box office anymore. They wanted Cheech by himself. The longtime comedy duo split. Cheech took full advantage and directed the film. There’s a little trace of their former films. Jimmy’s role would have been Chong’s if he’d been on screen. Born In East L.A. is as current now as 32 years ago. In the last few years there have been legal US citizens caught by ICE and put into deportation proceedings. People who for some reason didn’t have identification or ICE didn’t admit it was real. So this is not a subject that belongs in the 20th Century like jokes about dial up modems and cellphones that can’t text. But don’t expect a major studio to greenlight a new Born In East L.A. Because the Twitternet would explode with people upset that a studio thought this was a laughing matter. Things didn’t appear to be as harsh back in the ’80s when it came to deportation. You can enjoy Cheech’s Born in East L.A. without thinking how this is belittling the serious headlines of today. The video is 1.85:1 anamorphic. The transfer brings out the dusty nature of Tijuana and the pink of Cheech’s VW Bug. The audio is DTS-HD Master Audio Mono. The level is fine for his journey on both sides of the border. The movie is subtitled in English. Audio Commentary By Director/Writer/Star Cheech Marin And Film Historian Marc Edward Heuck deals with Cheech going on his own for the first time after being known as part of Cheech and Chong for nearly two decades. Interview With Cheech Marin (31:19) has him discuss going from the video to the feature film. He talks about the kid who inspired the story that was deported and roamed the streets of Tijuana from months before his parents discovered he had been deported illegally. Interview With Actress Kamala Lopez (14:25) has her discuss going from an episode of It’s Garry Shandling’s Show to working with Cheech after a lot of auditions for the role. Interview With Actor Paul Rodriguez (13:36) has the comic talk about getting to work with one of his comedy idols. He was a guest visitor on Nice Dreams. Cheech doesn’t really speak Spanish. Extended Television Cut Of Born In East L.A. (93:56) is in full frame and standard definition as if you saw this on cable back in the ’90s. The major addition is an extended ending that doesn’t end with the border crossing. Everything from the first act ties together. Theatrical Trailer (1:27) talks of how this was day his ability to be in the right place at the right time went bad. Production Notes (2:46) is the press book that would be sent to my old desk at the Technician. Shout! Factory presents Born In East L.A.: Collector’s Edition. Directed by Cheech Marin. Screenplay by: Cheech Marin. Starring: Cheech Marin, Daniel Stern, Paul Rodriguez, Jan Michael Vincent & Kamala Lopez. Rated: R. Running Time: 80 minutes. Released: March 19, 2019.